Also known as SJ.I've been involved in architecture and interior design since the late 80's (yep! I've seen it all--and some I never want to see again).It all started with my first house plan in Nebraska and grew from there.My love for the field has taken me to design for clients in Brazil, Russia, Germany and Finland. A king-sized bed needs a Kong-sized electric blanket to keep you from freezing during those dark winter months. Apart from being huge and wonderfully warm, the biggest electric blankets also have a dual control feature that lets both you and the person sleeping next to you adjust the heat. Some even have separate adjustments for each side so both of you can enjoy warmth tailored to your needs.We’ve rounded up five of the best dual control blanket models to make preparing for next winter easier on you. Take in their detailed reviews, and get one that will make both of you warm & happy. The best electric blanket needs to do two things – warm you up nicely, and let you control how it’s going to do this in a nuanced way. Enter BioSmart with their infrared blanket complete with minimal wiring, low voltage, and two wireless remotes for the easiest temperature adjustment you’ll ever encounter. The blanket is made with a number of breathing microfiber layers that keep heat in, but let moisture escape. Mild climes will see you using it without turning to any of the 10 different heat settings. Once the cold sets in however, you’ll be glad that you can change the amount of heat it puts out on the fly and from anywhere as the blanket comes with two wireless remote controls.Another feature unique to the blanket are its temperature sensors. They pick up on your body temperature and regulate the heat output accordingly, so you can enjoy a warm bed even if you’ve set the temperature too low inadvertently.As everyone wants to save on their power bill as best they can, BioSmart has made sure that the blanket is economical. Its DC adapter pulses only every three seconds, drastically reducing its power consumption compared to other similarly-sized blankets.The wireless remotes, are a great feature, but don’t light up until you touch them, so you won’t know whether the blanket is on or not at night, and may have trouble finding them if you forgot where you left them. It also has an annoying habit of beeping. Usually this only happens when there are problems with the blanket, but it can beep for no discernible reason too, potentially waking you up. If you insist on American-made sleepy goodness, you’ve most likely heard of Sunbeam, the leading heated blanket manufacturer in the states. They’ve been making blankets for 100+ years, but apart from quality, much has changed since your grandma’s Sunbeam blankets. The proof is right in front of you. While the wires are coiled similarly to ones found in old-timely models, they’re now much thinner and move along with the blanket so you’ll likely forget it’s heated until you turn one of its controllers on. Ten different settings can be set, and the blanket has a built-in thermostat which senses temperature drops as the night goes on. It then compensates for them to give you an uninterrupted and uniformly warm 8 hours of sleep.It’s one of the softest and most luxurious electric blankets we’ve seen and a far cry from the stifling cardboard boxes of yesteryear. The channeled micro-plush fabric looks elegant and feels very soft to the touch. Best of all, the blanket is both washer and dryer safe. As it’s been stitched to have individual pockets, the fabric won’t crumple up or pill.You don’t need to worry about leaving the blanket on as it will shut itself off after 10 hours. It’s a shame that you can’t program it to do so earlier though. Along with being soft, the fabric is also smooth… too smooth. It won’t work well with silk bed wear as it might slip off if you toss and turn during the night. After a couple of hours, the temperature you set your electric blanket to before going to sleep might become too hot and uncomfortable. Many models don’t address this properly, when the simplest solution is to add an adjustable timer. Thermee’s blanket has one, but that’s not where its strengths end. This is a blanket you can fine-tune to perfection. On one hand you’ve got 10 temperature settings to choose from, on the other, the timer lets you set the running time to as little as one hour, saving power and making the blanket perfectly usable when just napping.It sports thin and flexile wires that are surrounded by six layers of micro flannel. The fabric is quilted to prevent it from moving around too much and ruining the blanket’s shape. It emits warmth evenly, and looks quite elegant thanks to its dual quilt and Sherpa finishes. Care has been taken to make the material slip-resistant, so even satin sheets won’t cause it to slip.However, it’s a shame that the controls aren’t a bit more intuitive. The controllers’ display windows are small and hard to make out, and the bright blue backlight doesn’t really mesh well with eyes that were in the dark long. More frustratingly, once the blanket is turned off, your settings are gone, meaning you’ll have to manually adjust the timer and temperature every time. One annoying thing about sharing a bed is that you have to put up with the other person’s temperature preferences. Fighting over your electric blanket’s settings will finally be a thing of the past once you lay Serta’s luxurious blanket onto your bed. Even if both of you crank the heat all the way up, it’s quite the power saver too. The blanket’s success lies in the combination of an innovative power supply and well-chosen fabrics. The former transforms your standard 110V AC current into lower voltage DC current that’s much safer and more energy efficient. 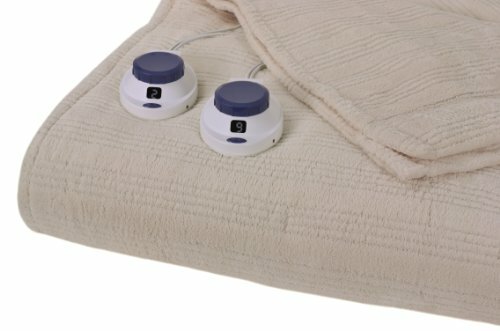 Since the blanket’s micro-plush fabric doesn’t pill or stretch, it provides a uniform surface through which soft wires are placed in a tight pattern that ensures your toes will be as warm as your shoulders.Speaking of warmth, the blanket is split into two zones, each of which can be individually controlled by one of the two controllers. There’s also a convenient pre-heat option which will put the blanket on its highest setting to quickly heat it up and then return to a previously selected setting and maintain its temperature. 10-hour automatic shut-off is included as well.Even though the difference between not using the blanket and setting it to high is night and day, it’s overall not a very hot blanket. It’s good for use during the winter, but may not be enough during particularly severe cold spells, or if you live in a mountainous state. The fabric finish tightly holds onto whatever you’ve placed the blanket on, so you’ll want to remove it gently each time to not make a mess. 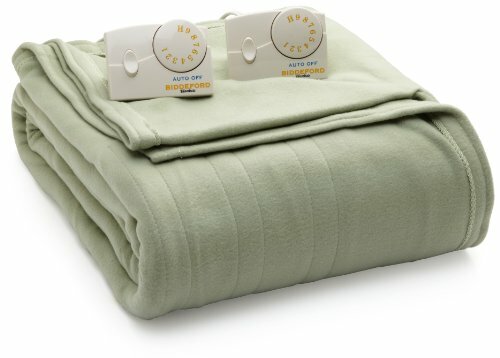 Along with Sunbeam, Biddeford is one of the most recognizable electric blanket manufacturers, and they’ve earned their fame with products like this Comfort Knit model. 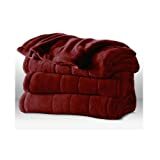 Quick to heat up, feather-light and chic to boot, it’s an electric blanket done right, all at an enticing price. Biddeford managed to get a lot of things right with this blanket. For example, t has a nice finish which isn’t rough, but won’t easily slip off the bed either. 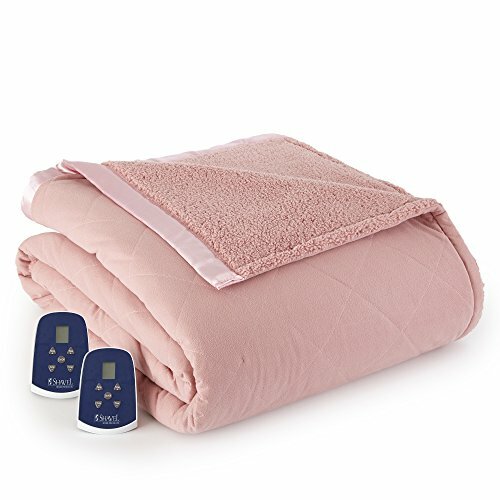 Once you settle on one of ten temperature presets and turn it on, the blanket is quick to warm up to the desired temperature and maintain it through the night. Each controller has a big dial with clearly labeled numbers and a cord long enough for it to reach easily all the way to your nightstands.You’ll need to take care not to keep the blanket on its highest setting for too long as it can get quite hot. A shut-off feature is present, but it takes a long time to kick in, needlessly wasting energy if you forget to turn it off. Keeping toasty even when it’s bitter cold outside is easy when you’ve got someone to snuggle with, and an electric blanket like BioSmart’s to do it under. 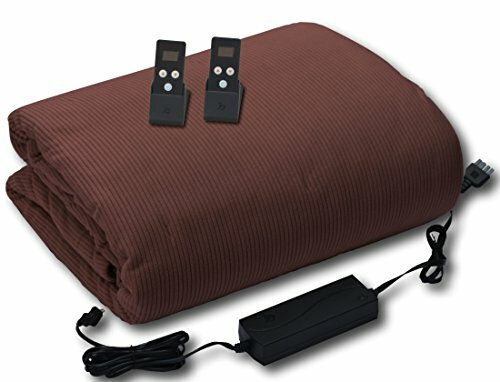 It’s our definite pick for the best dual control electric blanket out there as its remotes offer the most convenience and it provides a great, balanced sleeping experience. If you don’t think that its features justify the premium price, there’s always a worthy alternative to choose from among the rest. How to Put on a Duvet Cover the Easiest and Quickest Way? What Can You Do to Make Your Hard Bed Softer and More Comfortable? Why is Crib Safety such a complicated issue? Some recommended products may use affiliate links. ModernBeddings.com is a participant in the Amazon Services LLC Associates Program, an affiliate advertising program designed to provide a means for sites to earn advertising fees by advertising and linking to Amazon.com. Amazon and the Amazon logo are trademarks of Amazon.com, Inc or its affiliates. Copyright © 2018 Modern Beddings | All Rights Reserved.